The publication of this document is intended to enable all stakeholders with an interest, particularly those with relevant technical expertise and knowledge, to engage with the Authorities on the detail of the proposals, prior to the introduction of the primary legislation later in 2008. I’m not sure whether Governmental campaigns to debunk myths work at all. 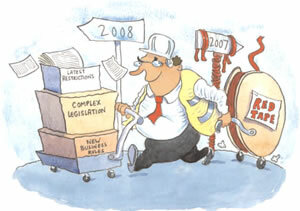 The UK’s Health and Safety Executive has been running cartoons on a page headlined “Myth of the Month” which try to challenge myths about regulation. The EU has a long list of euromyths from the UK media. And it seems that there has been a similar problem in Romania. But there is a more complex problem than can be addressed by such periodic denials, and it isn’t helped by governmental support of the ideas of better regulation – although this claims to be about ensuring that inappropriate regulation is eliminated/not applied, it often seems to be about the idea of regulation as a problem, rather than as sometimes necessary to protect vulnerable groups. We conclude that the BRE has made a significant contribution to improving regulation in a relatively short period and will have a crucial role to play in co-ordinating further reform. It is seen as a positive force in changing regulatory culture, although it could perhaps do more to publicise its role and achievements, which we believe should be more widely recognised. The BRE now needs to focus on change that builds on reform to make greater impacts on perceptions of regulation. That will need creative and persistent work to fit regulation better to the way in which businesses, consumers and all members of society behave. The plans for trees are an example of the dangerous bureaucratic spiral which can be caused by the complex interactions of different groups. Those who fear they might be held liable in the event of some incident look for compliance standards to remove legal uncertainties. Then there are “risk entrepreneurs” among treecare professionals who thrive on maximising the perception of risk in order to create standards for which they are perfectly placed to provide profitable solutions. Public and media opinion will often tend to agree that ‘something must be done’ in light of one or more tragic events. The result can too easily be new regulations introduced without a balanced assessment of the true level of risk against the possible wider damage which can be done by heavy-handed regulation. The inherent risks associated with trees mean that it is a mistake to manage them in an overly risk-averse manner. In addition to considerations of tree safety, it is important that management decisions are taken in light of their wider benefits (aesthetic, ecological, environmental and sociological). Management decisions to address identified hazards that exceed what is necessary to the detriment of these benefits are inappropriate. The IIF published its final (long) Report on Principles of Conduct and Best Practice Recommendations yesterday (this report follows April’s interim report). The report combines a set of principles with some recommendations and some lobbying (labelled “consideration for the official sector”). The principles are general and the report states that the recommendations may not be appropriate for all firms – they are “benchmarks”. A robust and pervasive risk culture throughout the firm is essential. This risk culture should be embedded in the way the firm operates and cover all areas and activities, with particular care not to limit risk management to specific business areas or to restrict its mandate only to internal control. we do not agree that differences in how supervisors supervise result in a material obstacle to the single market. Rather, different supervisory practice can reflect differences in market structure, market behaviour and local culture, which are valued to firms and consumers. A common supervisory culture thrives on that diversity of practices and experiences. Developing a common supervisory culture does have real value because it facilitates effective collaboration and by reinforcing common values and principles it will help provide for similar regulatory outcomes. I’m not really sure what all these words mean. In general the UK’s response emphasises that the responsibility for regulation should be left with the national regulators, and not subject to supervisory control by the committees, an approach which is consistent with the recent (and not so recent) focus on the need to ensure the competitiveness of the UK financial sector. I agree with the first of these. I loved the The Little White Horse by Elizabeth Goudge, and still remember the tea party, many years after reading about it. On the other hand, lots of stories I read as a kid involved the main characters stuffing their pockets with food. And I always loved the food descriptions in Arthur Ransome’s swallows and amazons books, which don’t appear on the list. My all time favourite Paddington food story (the list includes Paddington’s elevenses in Paddington Bear) is the one with the dumplings that invade the house. But what about Pooh having to look all the way down to the bottom of the jar to make sure there is no cheese there? The current difficulties besetting the EU financial industry are important — but they should not lead us to lose sight of these longer term challenges. There will be a million reasons why progress will be hard to achieve. There will be thousands of voices defending the status quo. But we need to take the longer-term view. Lack of transparency and regulatory gaming are not a good basis on which to build sustainable markets or successful businesses. There is a lot that we can do — particularly through effective product disclosures — to improve the quality of investor outcomes and facilitate competition based on the quality of products. These do not require us to turn the European financial rule-book on its head. By the end of the year, I would like to be able to set out a number of steps that we can take to start the necessary progress towards this objective. will report directly to the High Level Group on City Competitiveness, which was set up by the Government in 2006 to develop and support a strategy for promoting London as a world-leading financial centre. will examine current market practices concerning equity capital raising by public companies, and report on whether changes are needed to UK company law, market practices or regulatory requirements to make equity capital raising more efficient and orderly. The proposals in Chapter 11 will be of particular interest to consumers. Chapter 11 deals with changes to allow the Financial Ombudsman Service to deal with complaints about debt administration services. Most of the document looks pretty technical on a quick skim, and it may be right that this is the most interesting aspect for consumers. But why, then, bury it in a long document full of stuff most consumers will never know exists, let alone read? It’s not flagged on the FSA’s consumer pages. Perhaps this is just a note to encourage the Financial Services Consumer Panel to focus on this part of the consultation. Visiting Asheville, NC, after living in Miami for a while, the ingles supermarkets signs looked to me as though they were advertising something English, or for English people (in Spanish) – and this happened the 4th and 5th and even 10th time of reading the signs. I’m not sure I would have read them that way 10 years ago. Looking at the ingles website, however there’s another link to Miami – Robert Ingles studied at UM! !